The wide range of customers from many different industries around the world that we work with has required us to become highly skilled in many methods of composites tooling and production. With this need to accommodate our customer’s requirements we have capabilities and tools that are unmatched by most composite shops. With our 3D laser scanning and verification abilities, Tiger Composites Inc. can also take hand crafted work in to the CAD model world. Our 12 foot Romer CMM arm and Perceptron laser scanner are also vital in the proofing of prototype parts and high tolerance tools and molds. 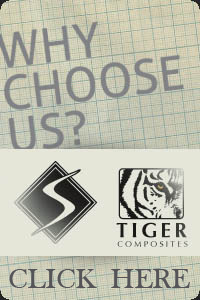 This guarantees that the part is right the first time and is a vital step in Tiger Composites' quality system. We maintain all of the equipment to perform these processes in house at each of our locations around the globe. Property of Tiger Composite, Inc. All rights reserved.